We love a treat here - in fact daddy loves them too much as a chocoholic. Given half the chance Jack also opts for chocolate (another chocoholic on my hands I think). However, I do try my best to feed Jack healthy foods and give him a treat once a day. Recently we were contacted by BEAR about trying their new range of BEAR Paws. BEAR are well known for their healthy range of snacks. Keeping in tradition BEAR Paws are made from 100% natural fruit which is slowly baked. They contain no added sugar, preservatives or stabilisers and even count as one of your five a day. 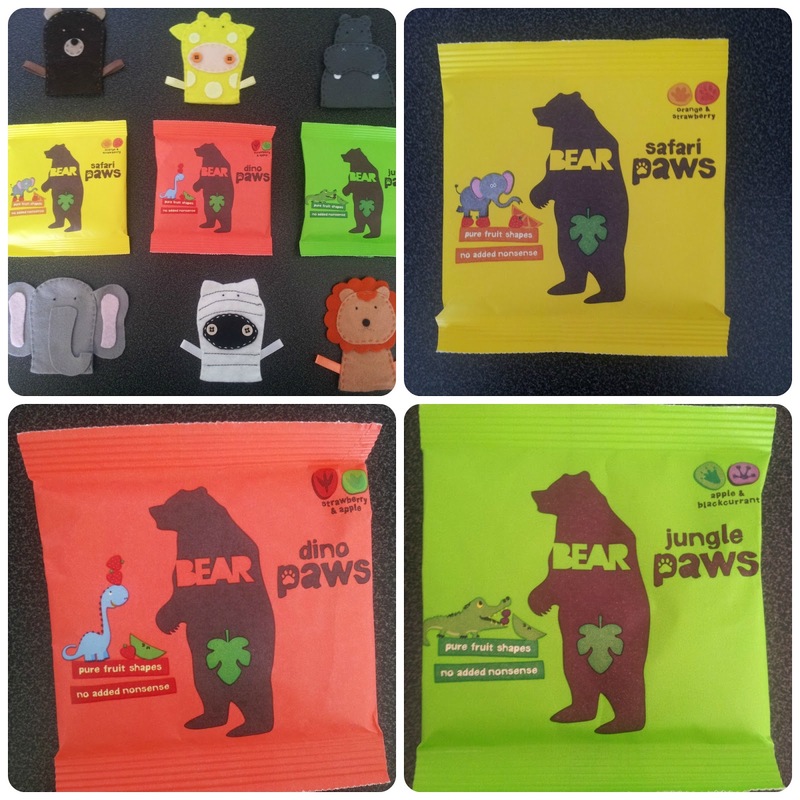 BEAR Paws come in 3 flavours - Safari Paws (orange and strawberry), Dino Paws (strawberry and apple) and Jungle Paws (apple and blackcurrant). On the back of each pack is a little educational game, unfortunately Jack is too young yet but it does look fun. Within each pack are 5 different paw prints which you match to the correct animal. The paws are like a jelly style sweet so you could even convince your child they are jelly sweets and I'm sure they would know no different. Jack has throughly enjoyed these as have I - well JAck can't tell me the taste. It's hard to believe they are just made from fruit especially with the texture. They are priced at 55p a pack so a great alternative to sweets and can be purchased from a range of stores including Sainsburys and Waitrose.